Horncastle Town dealt a crushing blow to the championship hopes of East Lindsey rivals Skegness Town when they inflicted the seasiders’ first defeat at the Vertigo Stadium. Will Britton. Photo: David Dawson. Former Lilywhite Liam Papworth did the damage with two second-half goals. 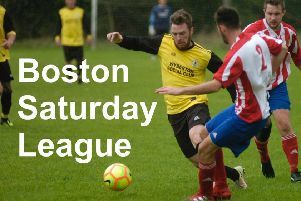 Ruston Sports can clinch the title with victory at Grimsby Borough Academy on Saturday. More importantly for Horncastle, this victory secured a league double over the reigning champions and bragging rights. The game came to life in the 17th minute when a heavily-deflected Scott Lowman shot gave the Wongers the lead. Horncastle keeper Lewis Burchnall denied Jamie Coulson with a superb save and, from the resultant corner, the ball eluded the keeper but Horncastle scrambled it off the line. The seasiders equalised 10 minutes before the break, Coulson sweeping home the lose ball after Will Briton, who later had an effort ruled out for offside, appeared to be fouled in the box. Andrew Bullivant missed a golden opportunity and Daniel Stevens was called upon to clear off the line before Horncastle scored their second, Papworth side-footing home at the back post. Four minutes later Papworth repeated the act. Skegness pulled a goal back in the last minute, Jordan Smith converting from the spot after being tripped. SKEGESS: Portas, Warren, Turner, Stevens, Parish, Hobbins, Smith, Lawe, Britton, Coulson, Cunliffe, Nichols, Potts, Parker. HORNCASTLE: Burchnall, Andrew, Fidling, Brown, Johnson, Lowman, Boulaid, Jackson, Blondel, Bullivant, Papworth, N Rawdon, Lovett, Wood, J Rawdon, Stephenson.